· Engine – 1040 HP, 12 litre engine mounted in the centre of the chassis for equal weight distributions over axles. · Steering Wheel – Detachable type fitted with 20-degree castor angle for better steer-ability and self-centring at corners. · Engine Cooling System – Intercooler mounted vertically & Inclined mounted Radiator with 2 cooling fans inside the closed duct. Additional nozzles for water spray on Radiator & Intercooler to enhance cooling efficiency. · Brake Disc Cooling – Air pressurised water fed to brake discs through sensor based Nozzle Jets. Primary cooling through continuous water flow & secondary jet operated automatically on increase of Brake Disc Temp. Arrangement has 3 Aluminium Tanks with a total capacity 180 litres of water. · Power cut off switch – Mounted at rear, operated manually, as well as mechanically. · Electronics system – App Based (Wi-Fi enabled) remotely controlled diagnosis. 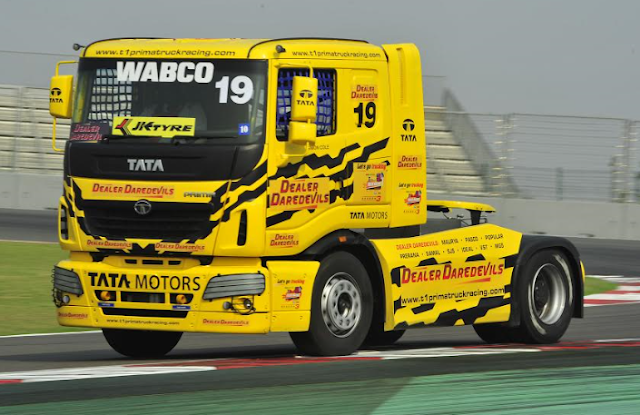 New Delhi, March 14, 2017: Entering season 4 of the T1 PRIMA TRUCK Racing Championship and in keeping true to its commitment of introducing first-of-its-kind initiatives as leaders in the Indian commercial vehicles space, Tata Motors will showcase an all-new powerful 1000 bhp T1 PRIMA race truck in Season 4 of the championship.